This week is National Nursing Week. The Saskatchewan government has proclaimed May 12 as Continuing Care Assistants Day and May 13 as Licensed Practical Nurses Day. 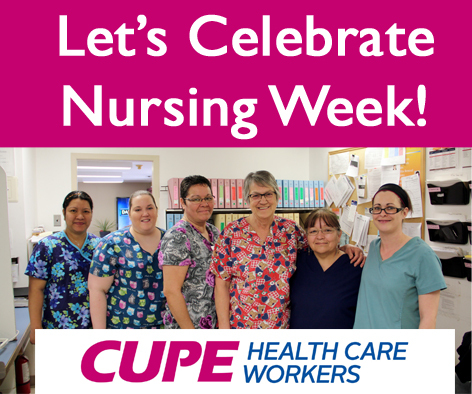 CUPE licensed practical nurses and continuing care assistants are key members of the nursing team. It is an important time to recognize the tremendous work CUPE members do every day to deliver high quality patient care as part of the nursing team. CUPE strongly supports multidisciplinary teamwork and full utilization of all team members’ skills and training. We will continue to advocate for our members and promote the amazing work you do. Thank you for all the work you do, today and every day. CUPE will continue to fight for a public health care system that allows for every team member to engage fully in providing high quality care.